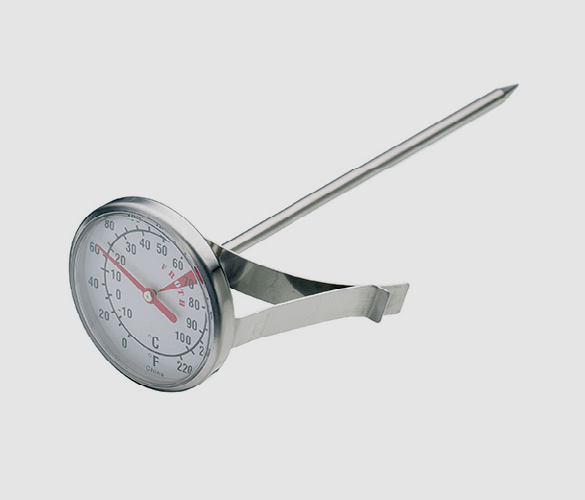 Milk Frothing Thermometer Stainless Steel. This convenient frothing thermometer is a quick and easy way to measure the temperature of your milk in the comfort of your own home. Be your own professional barista and get creative in the kitchen. Use this thermometer to perfect your cappuccinos, lattes, mochas and much more. Does your hot drink routine consist of a filter coffee every morning? Try something new and get creative with your brewing. This easy to use this device is perfect for beginners and has been specifically designed to measure the temperature of milk. Why is measuring the temperature of your milk important? Measuring the temperature of your milk is vital to get the best flavour from your coffee. Coffee Info tells us that different levels of steamed milk can give very different flavours and tastes. When milk is being frothed, small amounts of air are forced into the liquid through steaming, and microfoam is created. This completely changes the structure and should create a light, smooth and creamy texture, if done correctly. If it doesn’t reach a high enough temperature, it will most likely not achieve this texture. If the temperature is too high, then you will scald your milk and it will be unusable. How do I use a milk frothing thermometer? Using a thermometer is easy and isn’t just for the professionals. This product comes with a convenient clip which can be attached to your steaming jug, which allows for much easier and safer use. It can take 10 seconds for an accurate reading to be taken, meaning it could go up by 10 degrees after you’ve stopped steaming. You will get used to this after a few practices and see that it is best to stop steaming around 10 degrees below the temperature you are actually aiming for. Always use fresh milk. Never use re-heated as it will just taste burnt and have a bad flavour. The best temperature for a latte or cappuccino is between 60 and 70 degrees. This product has a handy indication on the face to indicate where this is. Always clean your thermometer between uses for hygienic and taste reasons. This is to avoid a build up of bacteria and not to transfer the taste of burnt milk to your new drink. Fill your jug just below the handle or no more than half way. This to avoid the milk overflowing during steaming. Turn the steam wand on and leave it for a few seconds to make sure there is no left-over milk in there before you put it in your jug. Once steamed, tap the jug on a counter to remove some of the larger bubbles. Swirl it round a few times to get a nice silky texture.